The new Millau Bridge (pictured) moved one architectural critic to call it "an epic work of art [with] an ambition far beyond utility." MILLAU, France  Stretching higher than the Eiffel Tower, the Viaduc de Millau Bridge "is a marvel of art and architecture," French President Jacques Chirac boasted as the world's tallest cable-stayed bridge was dedicated on Dec. 14th. 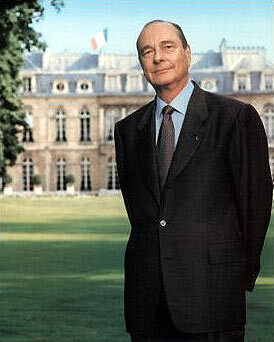 French President Jacques Chirac (pictured) hailed the Millau Viaduct as "a magnificent example in the long and great French tradition of audacious works of art, a tradition begun at the turn of the 19th and 20th centuries by the great Gustave Eiffel." (www.a75.com/viaducengl.html) was dedicated with fanfare aplenty. French Air Force jets roared over the rugged gorge, trailing exhaust plumes of red, white and blue, the colors of the French national flag. "The Millau Viaduct takes its place among our most shining works of civil engineering," Chirac said while unveiling a commemorative plaque at the bridge. "[It] is a magnificent example in the long and great French tradition of audacious works of art, a tradition begun at the turn of the 19th and 20th centuries by the great Gustave Eiffel." Eiffage (www.eiffage.fr)  the same firm that built the Eiffel Tower  headed up the project team and built the four-lane bridge. As part of winning that coveted assignment, the Paris-based private-sector consortium contractually agreed to complete the crossing in an ambitious 39 months. It bettered that, but not without obstacles. Miserable weather hit soon after Eiffage started construction on Oct. 10, 2001, suspending work. The government revised its time table, naming Jan. 10, 2005, as the opening day for vehicular traffic. Eiffage beat that schedule by a month. After laying the first stone on Dec. 14, 2001, the company finished 36 months later. Vehicles began crossing the Millau Bridge on Dec. 16th, two days after its dedication. And the company spent "only" some US$520 million - about half of the initial cost estimate - in completing the complex building process. The end result is a technologically advanced bridge that's more than 132 feet (40 meters) taller than the Eiffel Tower. And it's only 132 feet (40 meters) shorter than the Empire State Building. French officials spent decades looking for a structural solution that didn't detract from the natural beauty of southern France's Tarn River Gorge (pictured). France; a France that invests in its future." Much of the bridge, though, actually has multinational roots. The design of the slender white viaduct - which Chirac called "a miracle of equilibrium" - was conceived by London-based Foster and Partners (www.fosterandpartners.com), headed by noted British architect Sir Norman Foster. The UK company worked with Dutch engineering firm Arcadis (www.arcadis-us.com), which was tapped for the bridge's technical design. 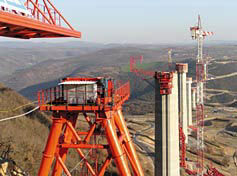 The bridge's engineering work was done by SETEC Engineering (www.setec.at), the arm of the of Germany's Gauff Group that played a major role in building the EuroTunnel. SETEC's team was led by acclaimed French engineer Michel Virlogeux, who devised the bridge's original concept. But despite its rapid construction pace and on-budget performance, the French project came to life only after many decades of deliberation. 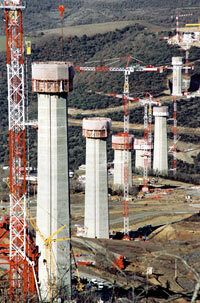 Each of the Millau Bridge's seven massive piers (pictured) is composed of 16 sections. Each section weighs 2,453 tons. realignment of its surface infrastructure. Peak-season summer traffic to the Cote d'Azur and Spain was creating tremendous bottlenecks in Millau, a city of some 22,000 residents. Traffic was routed down into the valley and through Millau, where it slowed to a crawl. The answer, though, wasn't so clear. The time-consuming rub lay in coming up with a structural solution that didn't detract from an area highly prized for its natural beauty. Franco planners considered four different bridge types, including one option requiring four separate spans. They also looked into burrowing a tunnel beneath the Tarn Gorge. In 1989, the French at last decided to build a single bridge across the middle of the gorge just east of Millau. Not until 1996, though, did national officials approve the cable-stayed design. The towering viaduct that's finally materialized only takes motorists a little more than a minute to cross. But its distinctive design and engineering are drawing raves from the global community centered on the business of building. Guardian architectural critic Jonathan Glancey, for example, called it "an epic work of art. . . . Of course, it is possible to design far more mundane bridges . . . But, just as our medieval cathedrals or greatest skyscrapers have an ambition far beyond utility, so do the finest bridges." That was what designers were aiming for, Foster explained at the dedication. "In our civilization, infrastructure is fundamental," he said. "Public spaces, avenues, bridges over rivers - these are what bring men together and condition our quality of life. But there are also needs which one cannot measure, which are more spiritual." One of the Millau Viaduct's most striking aspects is its unique fusion of size and strength with a sense of slightness. 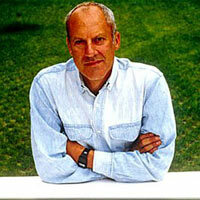 "The bridge could not look as if it had been tacked onto the scenery," said designer Norman Foster (pictured). "It had to rise out of the landscape with the delicacy of a butterfly." "From some angles, the structure is quite ethereal, almost vanishing in the bright light of this high and immense country," Glancey observed. But the Millau Bridge is immense as well. The roadway alone weighs some 39,600 tons (36,000 metric tons). The total structure's weight is about 266,000 tons (242,000 metric tons) - 226,000 tons (206,000 metric tons) of concrete and 40,000 tons (36,000 metric tons) of steel. Much of that steel went into the 154 stays attached to the bridge's seven massive concrete piers. The tallest of the pillars is 807 feet (245 meters). The top of the largest pier is big enough to hold a regulation tennis court. Those dimensions underscore the difficulty in fusing minimalism and immensity. Each pier, for example, is composed of 16 sections. Each section weighs 2,453 tons (2,230 metric tons) and measures 56 feet (17 meters) by 13 feet (four meters). The pillars' sectors were assembled at the construction site from 60-ton (54-metric-ton) deck units that Eiffage manufactured at two of its French factories. The piers "had to look almost organic, like they had grown from the earth," said Foster. "The bridge could not look as if it had been tacked onto the scenery. It had to rise out of the landscape with the delicacy of a butterfly." Delicacy was also a prerequisite in positioning the bridge decks atop the piers. For that task, the Millau project team used a hydraulic system built by the USA's Enerpac (www.enerpac.com). The decks were eased out across the gorge  very carefully  by satellite-guided hydraulic arms. The sections moved forward by only 23.6 inches (59.9 centimeters) every four minutes. Advances in computer-aided design also facilitated precise calculations for stress tolerances. Vehicles are shielded from the area's high winds by transparent screens standing 10 feet (three meters) tall along the bridge's sides. 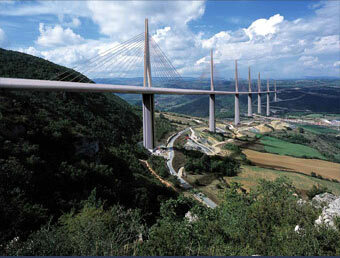 Those see-through sections accentuate the Viaduc de Millau's sensual aspect. The structure is built with a slight curve to enrich the view for drivers. The highway also has a three-degree slope that descends from its south end to the north. Foster, who's also a private pilot, says that the bridge is designed so traversing it feels like flying  in a car. The extremely short crossing time also promotes a sensation that strikes some as resembling a fleeting dream. "Ideally, passing over the bridge should allow one to 'elevate oneself,' " Foster explained. "We were attracted by the elegance and logic of a structure that would march across the heroic landscape, and  in the most minimal way  connect one plateau to the other. We were driven by the scale of the idea and a shared a passion for the poetic dimension of engineering and its sculptural potential." alternative route from north Europe to south France and Spain, and it directly connects Paris and Barcelona. Eiffage will now reap the fruits of its complex labors through a much simpler process: collecting bridge tolls. Project construction included a $20-million toll booth, which is located about 3.7 miles (six kilometers) north of the span. Government officials are projecting that bridge volume will range between 10,000 to 25,000 cars a day. Tolls for autos will run about $6.70 per trip, rising to about $9 in the peak months of July and August. Large vehicles ferrying heavy goods will pay about $27 per trip. Standing 1,132 feet (343 meters) tall, the Viaduc de Millau easily overshadows the previous world record-holder for the world's tallest cable-stayed bridge: Japan's Akashi Kaikyo, built in 1998 to connect the city of Kobe on the mainland with Awaji on Awaji Island. 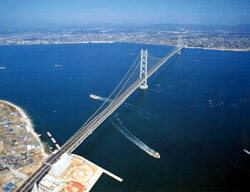 Akashi Kaikyo's highest points are towers that reach 944 feet (283 meters). The Millau Bridge, though, seems to be the kind of project that evokes feelings that stretch well beyond statistics. "Looking at it should provoke an emotion," Foster said of the new crossing. "Its purpose is to allow people to cross the valley without damaging the town of Millau. But it goes far beyond that." ©2005 Conway Data, Inc. All rights reserved. Data is from many sources and is not warranted to be accurate or current.